http://www.ljwilliamson.com/wp-content/uploads/2015/01/LJW_-_Adult_Bike_Classes-ee31d465.mp3 Did you know one in nine adults don't know how to ride a bike? If you're one of those nine and living in Los Angeles, here's your chance: Cyclists Inciting Change Through Live Exchange, or CICLE, offers a monthly two-hour ?Learn To Ride For Adults? class that will teach you how to get up on two wheels. On a sunny Sunday morning in Eagle Rock, cars zip by on the 2 Freeway. But in the Macy's parking lot along Colorado, it?s spacious, quiet, and nearly empty as a CICLE class starts up. Sherene Hulugalle's here for her second time. "When I first came I was terrified, I was sweating, actually," she said. "But there?s nothing to be afraid of. Especially the method they use, where you can keep your feet down. It kind of ? you know ? it takes away the anxiety." CICLE keeps the class small ? five students is about average. But today, there are just three. Dan Dabek, CICLE's director, estimates that in the three years he?s been teaching the class, he?s taught 175 to 200 adults how to ride. "I think that a lot of people have tried riding bikes or they?ve had experience maybe as children or as adults and sometimes those experiences weren?t positive," said Dabek. "And those are things that people carry with them in the class, and that?s a big hurdle that we try to overcome in the class." Hulugalle agreed ? she's no exception. "As a child I tried and failed, because my brothers would put me at the top of a hill, and watch me fly down," she said. "So I kind of gave up on the idea for 40 years." The class moves in tiny steps. 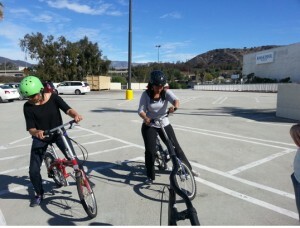 After putting on their helmets and sitting on their saddles, instructor Julia Lippe-Klein has the students start by scooting the bikes around the parking lot with both feet on the ground. Pedals haven't even entered into the picture. "With each exercise today, they?re building on each other," said Lippe-Klein. "So you?re actually just gonna be walking the bike, you?re sitting on the bike, you?re gonna be using your feet to move your forward." Unlike kids, Dabek said, adults tend to over think matters like this. Riding a bike doesn't happen in your head ? it?s about motor skills. Dabek and Klein?s challenge is to get students doing more feeling than thinking, so they can commit the process to muscle memory. In today?s class, everyone seems to be doing okay ? until it?s time to turn. Hulugalle's beginning to struggle as she attempts a couple zig-zag maneuvers. "I hate it. I just hate it," she said. "I just have a thing about zig zags. I don?t want to ever turn. I want to go straight." When the class's two hours are up, some students are close, but just short of success. No one feels daunted, though. They?re all looking forward to the day they know they?ll be on a bike. "I just want to ride on Venice Beach. I mean, that?s like my big thing right now," said Hulugalle. "And I?m not in a rush, I don?t know why. I?m the most impatient person on earth. But this thing, I?m not in a rush. I just feel I?ll get it. And when I do, I?ll ride." CICLE?s ?Learn To Ride? class for adults costs $30, or $40 with bike rental, but fee waivers are available. See CICLE's website for scheduling and more info.